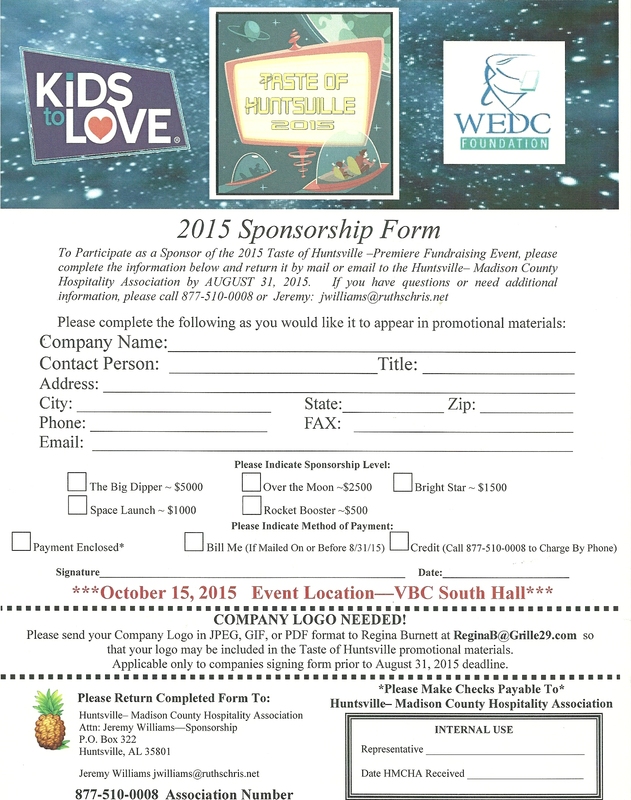 This year's Taste of Huntsville will benefit the WEDC Foundation and Kids to Love. We need your support! 1) Sponsor the event. See form below. Contact jeremy jwilliam@ruthchris.net 877-5140-0008 deadline August 31st. 2) Donate an Item for the Silent Auction! contact a Foundation Board member : Beth Brooks, Sandy Edwards, Lane Fabby, JoAnn Perez, Sonja Greene, Miriam Ezell, Janice Sanders,[too name a few] or drop something by the foundation office at 301 Washington St (3rd Floor) or bring to Thursday's luncheon.